HomeAstronomy HistoryWas Stonehenge an Ancient Observatory? Stonehenge in Wiltshire, England, is just one component of a complex of prehistoric monuments that is covered by the UNESCO World Heritage program, and also includes the village of Avebury and its associated sites. However, nothing definitive is known about the peoples and cultures that constructed Stonehenge over the period from around 3,100 BC to 2,000 BC. In the 18th century, a feature of this iconic Neolithic monument known as the Avenue was subsequently discovered which first made it evident that the structure was oriented with the Summer Solstice sunrise. In the northern hemisphere this occurs around June 21, and marks the time after which the days stop growing longer and begin to shorten once more. Stonehenge appears to mark this point in the calendar as on midsummer’s morning the Sun rises directly over the Heel Stone as seen from inside the Stonehenge monument, which then casts a long shadow that enters the Sarsen Circle through the main entrance, to some symbolizing fertilization of the Earth Goddess (Sarsen Circle) by the Sky God (the Heel Stone) at the height of the Sun’s power. This has led a few researchers to suggest that Stonehenge was used primary as an astronomical observatory, and even make further speculative claims concerning the site’s use and connection to astronomy. Nevertheless, we can only theorize as to the main reasons why so much time and energy was spent on building Stonehenge and other nearby, similar structures. Furthermore, some human remains have been found near and even under some standing stones, perhaps pointing towards Stonehenge being primarily used as an important place of sun worship, and a religious burial site. In this article we will therefore explore some of the astronomical claims made over the years about Stonehenge, beyond marking the solstices, which are accepted as the main dates of cultural and religious importance for ancient people. When William Stukeley first investigated Stonehenge in 1720, he recognized that one feature, known as the Heel Stone, which is located outside of the ring of standing stones, was somewhat aligned with the point on the horizon where the Sun rises at the summer solstice. However, he also noticed that the Heel Stone was placed slightly to the right of the exact summer solstice point of sunrise, which seemed strange, since this offset could not be explained by a change in the obliquity of the ecliptic since the monument was constructed. The problem remained unresolved until evidence was uncovered that a second stone to the left of the extant Heel Stone was placed so that the sunrise would have been “framed” between the two stones. Along with Edmund Halley, Stukeley was also the first researcher to attempt to date Stonehenge in a scientific manner. Stukeley worked on the assumption that Stonehenge’s’ builders had used “[a]magnetic compass to lay out the works, the needle varying so much, at that time, from true north.” It is not exactly clear how much “so much” was, but essentially, Stukeley and Halley attempted to calculate the variation between the actual, and the ideal position of the point of (summer solstice) sunrise relative to the Heel Stone, which based upon their calculations pointed towards the year 460 BC as being the date that Stonehenge was constructed. Although this date later proved to be wildly inaccurate, Stukeley’s attempts to date a monument remains a remarkable achievement in a time when archaeological excavations were performed mainly with dynamite. Unlike William Stukeley, who had found only one astronomical alignment at Stonehenge, researcher Gerald Hawkins found several dozen alignments with the Sun and the Moon using the Harvard-Smithsonian IBM computer, which in 1963, was not only a sort of supercomputer, but a novelty as well. During his investigations, Hawkins had identified 156 prominent features of the monument, and used the computer to check these points for possible alignments with the rising and setting of the Sun, Moon, planets, and many bright stars against the positions these bodies would have occupied during the year 1,500 BC. As it turned out, Hawkins’ computer identified 13 almost exact solar and lunar alignments that related to very early features of the monument; however, later (younger) features of the monument returned progressively less accurate results. Moreover, Hawkins also stated that by moving markers from one Aubrey hole (named after their discoverer) to the next in varying patterns, it was possible to predict lunar eclipses. Together with J.B. White, Hawkins published his findings in 1965 in a book called ‘Stonehenge Decoded’ in which the authors claim that apart from anything else, Stonehenge was in fact a “Neolithic computer”. However, Hawkins’ work was severely criticized by Richard Atkinson, a respected archaeologist and authority on the prehistory of ancient Britain. In an article that appeared in the journal Antiquity in 1966, Atkinson pointed out that at least some of the “pits” that Hawkins had used to calculate astronomical alignments were almost certainly natural depressions. More importantly, though, Atkinson showed that Hawkins had allowed errors of up to two degrees in his alignments, which invalidates much of Hawkins’ results. Based on these and other factors and mistakes made by Hawkins, Atkinson concluded that instead of the “million-to-one” alignments Hawkins had found, the probability that the 156 prominent features of the monument chosen by Hawkins would align with at least something in the sky, was at most 0.5, which is well within the realm of pure chance. Although Alexander Thom had been investigating stone monuments for several decades, primarily to look for astronomical alignments based on the megalithic yard (about 2.72 ft, or 0.83m), which is believed by many to have been the basic unit of measurement that was used by the builders of ancient stone circles, he only got around to investigating Stonehenge in 1973. Nonetheless, unlike other researchers, Thom chose to ignore all and any features within Stonehenge, on the grounds that they were too close together to form reliable and/or accurate sightlines on which to base astronomical alignments. Instead, Thom focused on looking for features in the surrounding landscape that could possibly mark astronomical alignments, with the line between the landscape feature and Stonehenge as a whole serving as the sightline. While Thom identified several such landscape features, one particularly important site, named Peter’s Mound, turned out to be a modern, 20th century rubbish tip, a finding that immediately cast grave doubts on the validity of Thom’s discovery of other astronomical alignments. 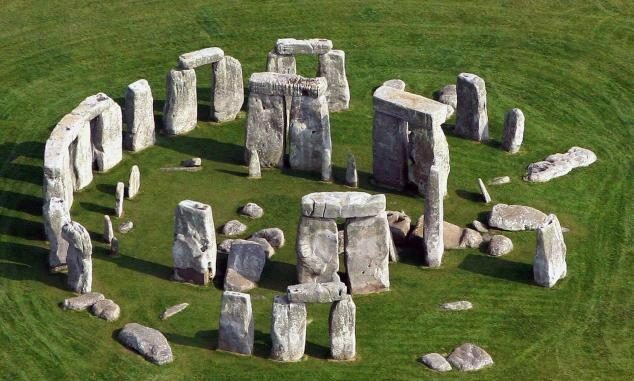 There are many other examples of researchers (including those of Sir Fred Hoyle, the famous cosmologist) trying to find evidence that “proves” that Stonehenge was built to serve as a sort of astronomical calendar. However, no compelling evidence of this has been discovered to date, and it is unlikely that such evidence will ever be uncovered. In fact, the only megalithic monuments in the UK that are unambiguously aligned with a solar event are those at Newgrange and Maeshowe, both of which are aligned with the winter solstice. Moreover, modern researchers have the benefit of perfect hindsight. They know that certain celestial alignments occur, and they also know when they occur, which makes it relatively easy to “align” some features of the monument with known phenomena, which is knowledge the builders of Stonehenge almost certainly did not have. Part of the problem of determining exactly how much the builders of Stonehenge knew about the movements of celestial bodies involves the British climate. There is no reason to believe that the climate provided more clear days during Stonehenge’s’ glory days than it does now, which means that observing the heavens then would have been as difficult for the people then living around the monument as present times. Nonetheless, despite the lack of definitive knowledge about why Stonehenge was built and what it was used for, there is no doubt that the structure had played a major role in the lives and religious beliefs of several cultures over a very long period, but what exactly that role had been is very much less than clear. 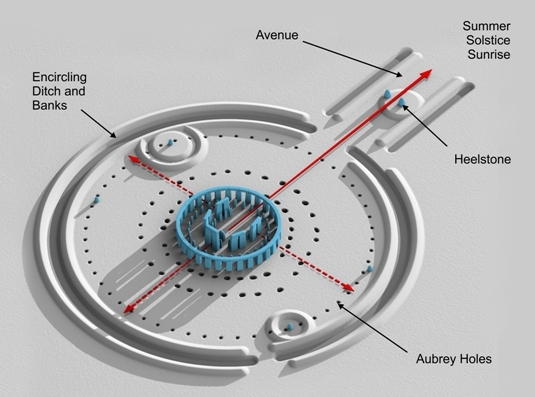 Was Stonehenge an ancient observatory? Alternatively, was it a burial ground or more likely a center of religion, where ceremonies of various kinds were conducted during the winter season? On the other hand, was it used for something else entirely, something we have not even thought about yet? These are some of the enduring questions that will likely continue to surround this mysterious ancient Neolithic and Bronze Age monument whose construction began more than 5,000 years ago.